Kapurung traditionally well known in Luwu cuisine South Sulawesi. Apart from traditional sago processing, they also produce cocoa beans and coconuts. As a staple, sago comes as a main ingredient in cooking and baking. One of the cuisine I know is Kapurung a simple sago soup where the sago balls formed by adding boiled water with rapid stir and two bamboo sticks to rolled on the mixture. 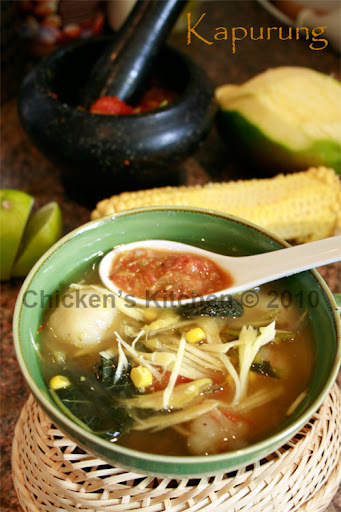 Any green veggies such as callalo, chinese morning glory, long bean or green beans and corn kernels will flavoured the soup as well. The sour taste from young manggo and lime traditionally they use asam patikala a.k.a kecombrang( torch ginger, English). The chilli sauce, I like to use lada katokkon ( habanero/ scotch bonnet pepper) together with tomatoes and shallots. All blanched. For the sago balls I use African cassava flour( not tapioca flour), the flour color is creme not white as tapioca and taste better too. The fish soup( pallumara), made from anchovy, turmeric, tamarind paste, ginger, lemon grass and fried shallots. Add boiling water into the bowl filled with thick sago paste, leave a minute until turn transparent, stir fast until all sago done. Bring to boil all ingredient. blanched and ground with mortar and pestle. Add sago balls into the soup, add more water, mix veggies and lime. Serves in bowl with shredded young mango.